Originally constructed in the 1930’s as a Works Progress Administration building, King Hall now houses classrooms and office space for Abraham Baldwin Agricultural College (ABAC). Located in the heart of campus, King Hall is critical to the overall academic mission of ABAC. 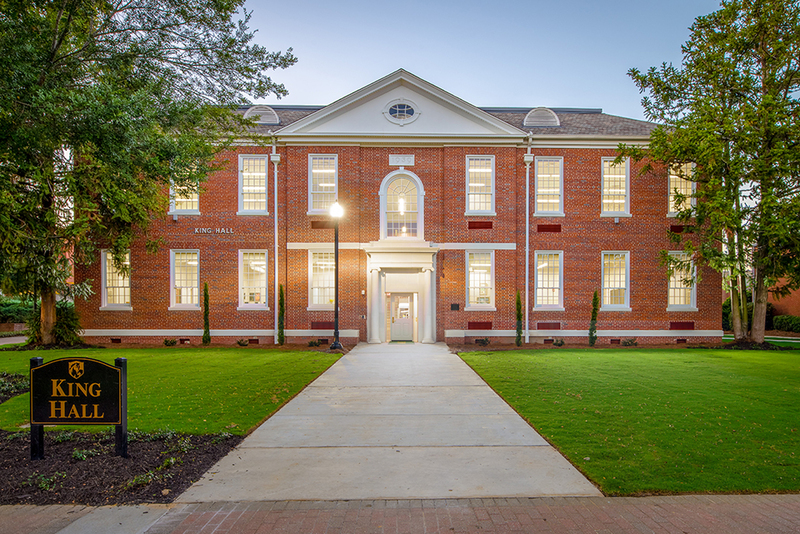 Garbutt Construction Company, along with McCall Architecture, completed a full rehabilitation of King Hall to address numerous issues that hindered the building from serving the college at its fullest potential. King Hall was brought up to code while the number of offices and classrooms were retained. An elevator and sprinkler system were installed to comply with ADA requirements, and all plumbing, electrical, and HVAC systems were replaced throughout King Hall to meet today’s building standards. Because the building’s interior was remodeled several times over the years, many of the original finishes were removed or covered up. The project team strove to maintain as many of King Hall’s remaining historic features as possible, and incorporated replicas of the building’s original windows.